L: 87" x W: 37" x H: 35.5"
Benson Leather Sofa Modern furniture is at its most luxurious with the Benson leather sofa. It's covered in top-grain, semi-aniline leather everywhere your body touches with a bonded-leather match on the backs and sides to keep it affordable. A single row of button tufting on the back pillows offers a fresh update to a classic design element, resulting in a contemporary look that will set the tone for your dream living room. Modern furniture is at its most luxurious with the Benson leather sofa. It's covered in top-grain, semi-aniline leather everywhere your body touches with a bonded-leather match on the backs and sides to keep it affordable. A single row of button tufting on the back pillows offers a fresh update to a classic design element, resulting in a contemporary look that will set the tone for your dream living room. Body and arms are upholstered in top-grain, semi-aniline leather, while the backs and sides are upholstered in a matching blend of leather and leather-look fibers for a look that’s affordable yet still luxurious. We love the color of this sofa. I tis long enough for my husband to stretch out in it (he is 5ft 9ins) and most of all it is comfortable and higher than the last sofa we had. We had a good shopping experience. The colors is beautiful. Comfortable. Delivery was tight because of hallway in my condo.BUT delivery guys were great and got it in perfectly. I got attracted to this sofa the moment I saw it in store. Its a recent purchase and yet to be tested by time. This is not my primary sofa so i could experiment with this one. 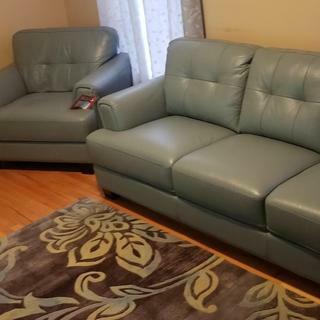 Though its not high end full leather sofa but I like the fact that its very comfortable, not slouchy, beautiful color, modern shape and sleek design that fits well in my narrow living room parallel to another microfiber sofa thats wider. So far i like it, and hope to enjoy it in coming years. This sofa not only looks great it is very comfortable. The lower arm makes it perfect for relaxing. Still too new to tell how well it will hold up but so far so good! Did not receive the color that matches the online/store product. I was looking for a more teal/ turquoise color; accept I received a grayish color. Not Charcoal either. When I called I was brushed off, but treated like a queen before the order and after purchase. Very disappointed because my big sister swears by Raymour and Flanigan. She encouraged me to purchase no where but here. It enhance my living room. It sits well I notice the previous review that it smell.It doesn't smell at all. I would like to buy the pieces. Very happy with this sofa. High quality. Soft leather and perfect firmness. Color could be brighter but 98% perfect! This sofa is well made, comfortable, and the style is fresh. The leather has a great finish, which will be easy to maintain. We really like the contemporary color, too. Bought the matching chair, and a contemporary rug with similar color gives us a designer look for our new living room. Love it! Love this sofa. Elegant and streamlined. Perfect fit in our ultra contemporary living space. And a unique way to reflect a pop of color. No pillows needed!! The furniture color is beautiful and vibrant. It makes the room look so light and airy. It is very comfortable and sturdy. There are no visable defects, not sure why it was in the clearance center. When I walk in the door it makes me smile. Can’t wait to match some pillows and throws. I think it will also be easy to match tables and other accessories. The couch looked great in our living room. I love my new couch! It’s quality is 5 star and your customer service is beyond expectations. we purchased the couch last Sunday. The couch was "Love at first sight" for my wife. The sales person, Laurie T. was terrific. She was knowledgable and very helpful. Delivery was punctual and efficient. This was our first purchase at Raymour & Flanigan and will return in the future. Great service from Dion, great product and great color. Comfortable , beautiful and fit right in. My salesperson was low key and the experience was a good one. Visited the store location last week. 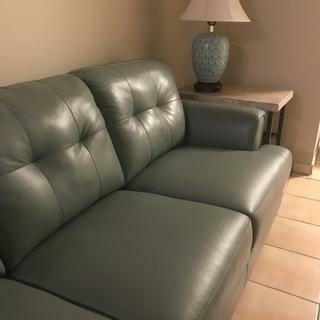 I am getting this couch, the color and quality of the leather is on point, plus an outstanding Customer service is just the best. I have bought a couch at this store before and their quality can never be better. Love my new couch !!! Love dealing with Christine. I couldn't love this couch any more than I do. It's comfy and solidly constructed. I had found it on the R&F website and went in the store to see it. Bought it immediately. Sales staff was great and the deal was easy. Delivery was on time and friendly. This is an awesome couch! 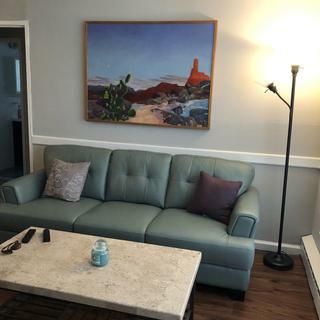 It looks great in our living room and is very comfortable. Absolutely love my new furniture! Love my new sofa, table and chair & ottoman! My family loved the coach. Got the love seat as well, cleans up good, comfy and looks great all at the same time. Very comfortable and well made. The leather is soft and the color is cool. Stylish sofa and loving it! So far so good! 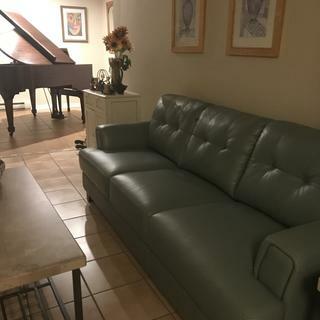 I bought the Benson leather sofa in the Sea (light green) color and was nervous that I had made a mistake! When the sofa was delivered a few days before Christmas as promised, I was delighted with how well it lightened up my living room! The guys were punctual and set it up within minutes. They very nice and professional. It had a stiff feel at first, and I thought my guests for Christmas were going to be so uncomfortable! What had I done? I was told that it would take a couple of weeks to break in, so I knew this could be an issue. I was pleasantly surprised within 4 days as it was more and more comfortable, just in time for Christmas Day! I got so many compliments as to the feel and stylish design and how the color just made everything pop! I love my sofa and would recommend stepping out of the safe "neutral zone". I have no complaints and am looking forward to years of quality and durability! Time will certainly tell the tale! Very happy, will recommend to anyone who love good things. This sofa sat much lower and softer in the store. I almost didn't buy it for that reason. I was pleasantly surprised when I sat in my new one at home. Much firmer with a higher seat. I'm thinking the sofa in the store must be well broken in. Love the color. Honestly goes with everything! Beautiful lines too. I'm very pleased with my new sofa and matching chair. I'm really happy because after the couch was delivered and the delivery guys had been gone about 15 minutes I was checking out the sofa and noticed a tear in the fabric on the back of the couch. I contacted customer care and sent pictures so they could see what I was talking about. Long story short, I was given an appointment for repair, however, the next day I received a call from them advising me this can't be repaired and there would be an exchanged. I received the new sofa today and everything is fine. Thanks Raymour and Flanigan. Awesomeness in the Living room! I love it! The color is awesome and really brightens the room! I wish it had more “give” but I guess that comes with time for a leather sofa. BEST ANSWER: The seat cushions are not reversible. BEST ANSWER: The Benson Leather Loveseat and Sofa are receiving top customer reviews. With a choice manufacturer and Italian top-grain leather, the Benson collection is a quality collection. BEST ANSWER: This sofa is well built. I also bought the matching chair because I was so pleased. Very comfy too. Frame has been fine. I've had it for a year. Yes, it’s a very good quality construction. I bought 3 of them for our large living room. They are very nice. We have had no issues with the frame. Sofa has stood up to many renters over the past 1.5 years. I am very please with my purchase good quality leather and craftsman ship. How can you tighten the legs? BEST ANSWER: For assistance, please contact customer care 866.383.4484, option 7. DO NOT attempt to tighten the legs! When I bought this couch the delivery team had to remove two legs to get it through my front door. The guy twisted a leg and broke it. A second delivery team brought me a new couch and they had to use a special tool/drill to remove the legs and not twist them at all. Twisting them was a big mistake. That first couch couldn't be repaired. Thank you! I guess I’ll see if the store can send me the tool to tighten it. Hopefully it isn’t too late. My apartment door is 29" wide. Can this sofa fit in the doorway? BEST ANSWER: The legs are removable with a special tool. Be careful because the first delivery team didn't know this and tried to unscrew the legs ruining the sofa. The new one was delivered by a great team that removed two legs in two minutes with a special tool and DONE! Great sofa! Very happy. Probably not. My door was 36" and it was tight fit. Do the feet come off to make it smaller for moving into the house? BEST ANSWER: Yes. Actually the feet come separately in a box, which is stored under the bottom lining of the sofa, and they have to be screwed on. Is this sofa available as a sofa/bed? BEST ANSWER: Hello Manon, thank you for your interest in the Benson LEather Sofa! It is not offered with sleeper sofa.